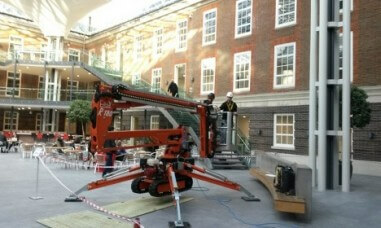 MC Property Maintenance specialises in providing Spider Cherry pickers for hire across the South East of England. Offering a number of different models to suit individual client needs, spider cherry pickers are a versatile and capable high-level access vehicle. These cherry pickers are designed to help complete construction projects, maintenance projects and even painting and decorating projects at height in good time. As a cost-effective and safer alternative to ladders and scaffolding, spider cherry pickers offer excellent access to restricted work areas. 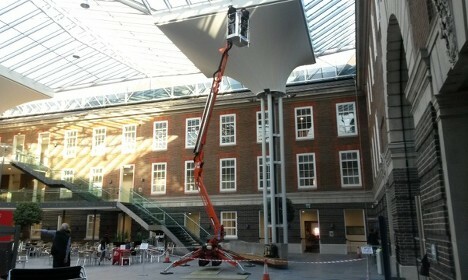 With a unique construction that makes it ideal for working on uneven terrain, the spider cherry picker hires range is one of the most lightweight and compact within the market place, weighing less than 2000kg. The spider leg design of the vehicle allows it to be set at different levels and at less than 1 metre wide and less than 2 metres high they can fit down the side returns of most properties and underneath all doorways. For general property maintenance, interior and exterior cleaning, mobile phone mast maintenance and even tree surgery, the spider cherry picker range offers flexibility at a fantastic rate. MC Property Maintenance is a Bognor Regis based company with extensive experience providing high-level access painting and decorating services for hire. Operating throughout the South East of England, including Kent, Sussex, Dorset, London and further afield, MC Property Maintenance put our local property knowledge to good use by providing property maintenance services at a consistently high standard. With both self-drive and operated hire services available, in addition to cherry pickers for hire, we provide everything you need for your next painting and decorating or construction project. MC Property Maintenance combine a strong reputation for high-quality machinery with experienced, knowledgeable operators. We go above and beyond client expectation when giving client specific advice and assistance for a number of property matters. MC Property Maintenance is also an officially registered IPAF and CPA company, giving you complete confidence in the safety and quality of our equipment and workers. Property Maintenance – Where both residential and commercial properties are concerned, Property Maintenance is incredibly important. MC Property Maintenance offers first class maintenance services in order to help clients renovate and refurbish their property, both outside and in. Services provided include gutter cleaning, the treating of woodwork, high-level access painting and decorating services and more. For more information on our range of spider pickers for hire in Sussex, Surrey, Kent or further afield, get in touch with our team today. Simply fill out the form found on the right or call us directly on 01243 530076 to speak to an expert. MC Property Maintenance offers situation-specific advice and assistance on choosing the best spider cherry picker for hire for your next construction or decorating project.